There is plenty of baseball left to be played in the Gainesville Regional at McKethan Stadium – and for that matter the entire 2014 NCAA Tournament – but none of it will include the Florida Gators. The top seed in its regional and No. 2 overall team in the event, Florida (40-23) was eliminated from postseason competition by the regional third seed North Carolina Tar Heels (35-26) on Saturday, dropping the contest by a score of 5-2. The Gators likely felt like they were experiencing déjà vu in Saturday’s game as, for the second-straight day, UF dealt with a rain delay in excess of three hours. This time, the game was halted in the third inning with junior left-handed pitcher Bobby Poyner (2.0 IP, 5 H, 2 R, ER, 2 K) on the mound. Poyner did not return after the delay, leaving freshman lefty Kirby Snead (1.0 IP, 4 H, 3 ER) with two on and no outs. Just like Friday night, Florida’s opponent returned from the delay with gusto and a major offensive output. North Carolina teed off on Snead for four hits, taking a 5-0 lead that proved to be insurmountable for the Gators. Florida chipped away at North Carolina’s lead late in the game but failed to put together a multi-run inning to give it a legitimate fighting chance. Redshirt junior first baseman Zack Powers (1/5, RBI) hit a bases-loaded single with two outs in the seventh that should have scored two runs. The Tar Heels caught a break when sophomore shortstop Richie Martin (1/5) tripped rounding third base. Martin was tagged out at home to end the frame and the rally. In the eighth inning, junior second baseman Casey Turgeon (2/4, RBI, R) made it a 5-2 game with a two-out RBI single. Sophomore center fielder Harrison Bader (1/2, BB) was hit by a pitch to start the ninth but there was no miracle rally to be had as Florida’s next three batters were retired in order, stranding Bader at third and sealing the deal for North Carolina. The Tar Heels were without their best player, SS Michael Russell, from the third inning onward. With UNC batting in the bottom of the second, a fastball got away from Poyner and hit Russell in the head, causing him to bleed heavily. The game paused for a 10-minute delay, by NCAA rule, to allow North Carolina to determine Russell’s status. Russell was replaced by pinch runner Zach Daly when the game resumed. After overachieving to capture SEC regular-season title and a national seed, UF’s 2014 campaign ended in disappointing fashion. 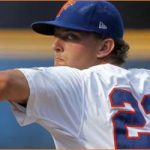 In a span of less than 22 hours, the Gators went from being the favorite to win the Gainesville Regional to completely eliminated from postseason. Florida was 4-for-20 with runners in scoring position over its two games, 3-for-15 on Saturday. As the No. 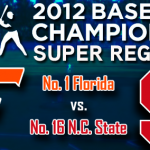 2 overall seed in the tournament, UF would have hosted a Super Regional in Gainesville, Florida, against the winner of the Coral Gables Regional. Florida has now lost its last six games in the NCAA Tournament dating back to the 2012 College World Series, including back-to-back sweeps in the 2013 Bloomington Regional and this year’s Gainesville Regional. Powers and redshirt junior hurlers Karsten Whitson and Keenan Kish all took part in Senior Day festivities, indicating this was their final game for the Gators. The 2014 MLB Draft takes place June 5-7. UF’s draft-eligible juniors will have until July 18 to either sign a contract or declare their intent to return for the 2015 season.